Description: Innovative programme to meet the needs of beginners and advanced practitioners. The CACU offer a fantastic opportunity to meet and greet expert sonographers in a small interactive group. You will have a true VIP experience on the front seat where you will be able to improve your skills during the hands-on sessions and to test your knowledge during the interactive cases with voting. Places are limited and will be allocated on a first come first serve basis. 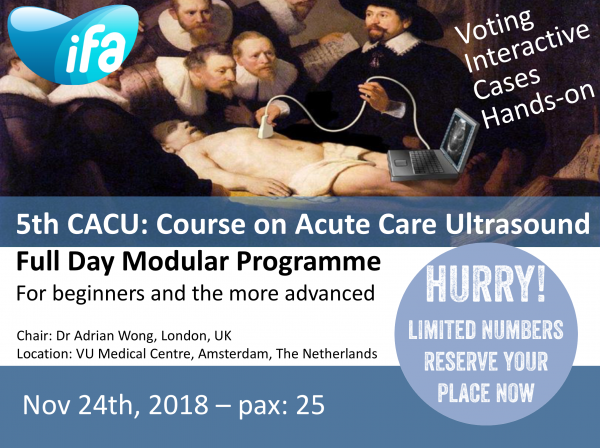 Background: Point-of-care ultrasound has become increasingly integrated into the practice of intensive care across with several accreditation programmes being developed by leading professional organisation and societies (ICS UK, CUSIC, SCCM, ESICM courses, Dutch ICS, ICARUS, WinFocus, HandsOnEcho and CACU in Belgium etc). This course incorporates aspects of all these programmes into a one-day innovative, modular course.